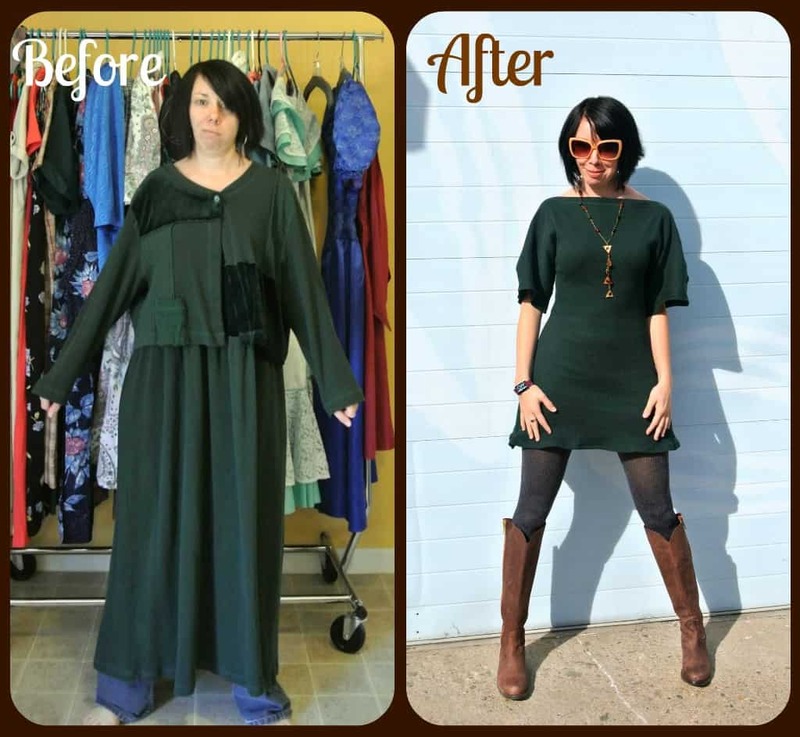 Remember the Trace & Stitch Dress I refashioned for my trip to Asheville a few months ago? Here…let me jog your memory. I dug the dress, but just couldn’t come up with a good way to save the jacket part…until a surprisingly chilly day when my little Douglas didn’t want to go outside, that is! 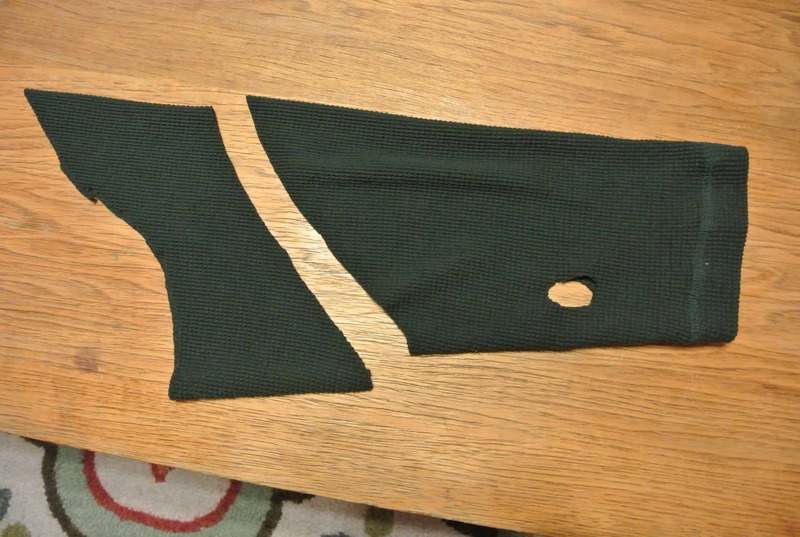 First, I cut off one of the sleeves! 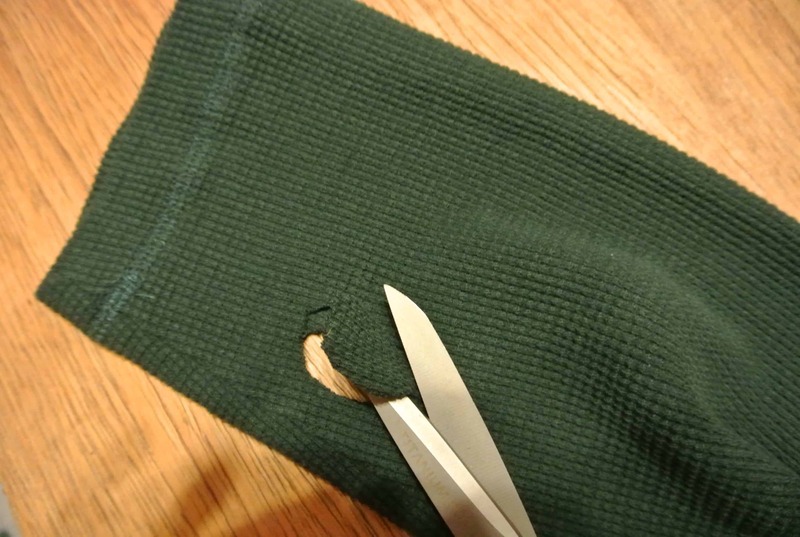 Then, I cut a hole through both sides of the sleeve that was big enough for Dougie’s legs to fit through. Did the doggy you were fostering get adopted? Photos of Douglas always make me smile! Thanks for sharing him! I am so very sorry to hear of your loss. :( I hope you find peace soon. “little puppy strippers wearing midriff-bearing crop tops” That is too funny. Stay classy Dougie. that was indeed very funny !!! I had a great laugh too. AHH That is brilliant! What a great idea!!! I hope its not too cold there in South Carolina, but regardless, I’m sure Douglas is happy with his extra layer. Stay warm and safe! Perfect! We just got a mini dachshund and she is so tiny nothing fits. I am thinking my son’s old sweaters will be just right. Thank you! Loved Dougies outfit! He’s adorable! That is soooo precious, wow, Douglas looks pretty happy oh and very handsome too! This is SO cute! You are so creative. Love this post. Love the hunter green on Douglas! Love this idea!!! AndI have a pile of sleeves that I couldn’t make myself throw away! Love it! My Coco (chihuahua mix) has at least 12 outfits (and counting). All but 1 was refashioned. Coco says hi to Dougie. Dougie is so sweet and cute! You’re such a good mommy to make him a cool sweater. Melting … melting … but in a good way!! So, so cute and very useful. I have dachshunds, they won’t wear anything. Douglas looks so cute in his sweater. 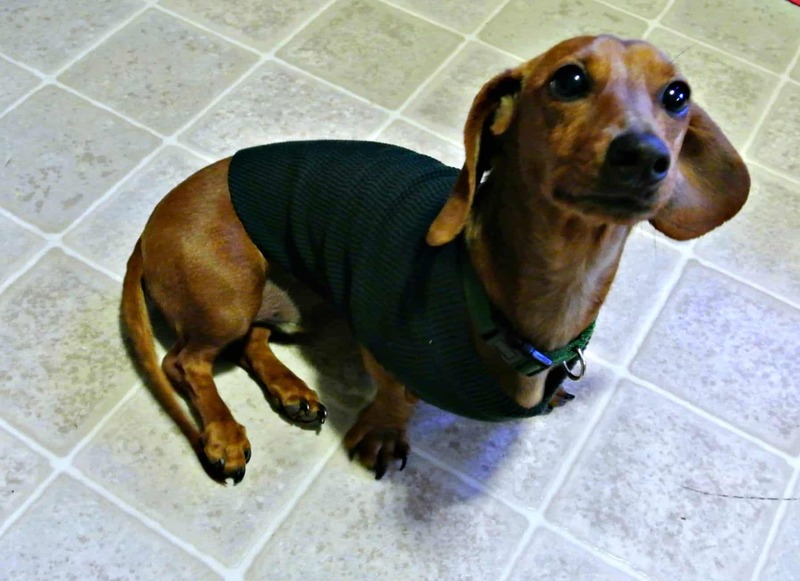 Dougie certainly looks handsome in his classy and WARM green sweater! What a great makeover! Love it….HA! 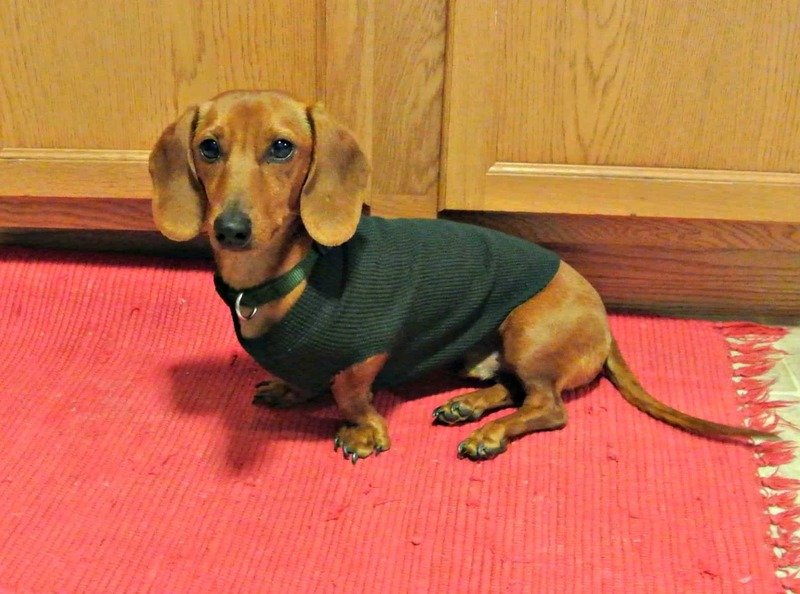 That is a brilliant idea – Dougie looks awesome in his sweater! Now if only I could find sweaters with large enough sleeves to fit my 60 lb Potcake! 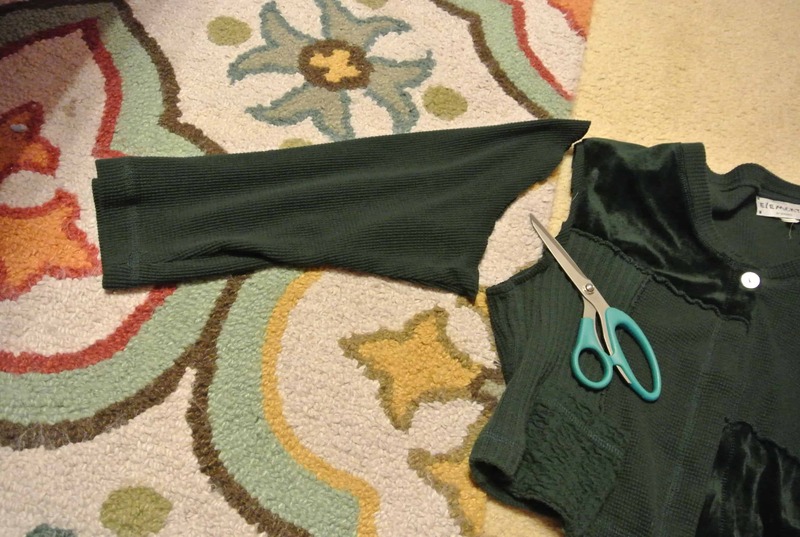 She has a redneck sweatshirt that I’ve adapted but I think the sleeve idea is fabulous, well done! Where did you find that rug?! I love your blog but everytime I see the rug I become obsessed and memorized by its beauty! I must know! Just when you think Douglas can’t get any cuter and the refashionista can’t get anymore creative, BAM! Nice work, and so glad his little belly is staying warm. Now that is a great idea! I could see this working with cats too, especially if you need something post-surgery or to protect stitches. The best bit is that not only does Dougie get be warm and avoid looking like a “puppy stripper” but he still gets to go Commando. Which is everything to a dog. What a great idea for dachshunds! As an added bonus, we got to see DOUGLAS! He’s a cutie pie. Adorable! I think that’s just what the doctor ordered for my doxie (it’s absolutely freezing right now in NW Ohio!). That little wrap for your dog is SO cute! Ha! Ha! I love your pup! We have a chihuahua/dachsound mix, and she is the light of our lives! We take her with us when we go wheeling in our Jeep, and sometimes we stay out past sunset. When we slip on our hoodies, so does she… sort of. I took the sleeve from an old hoodie of mine (it was stained & torn), and turned it into a hoodie for Lula! I also took some old ski pants, & made her a waterproof, fleece lined (scraps from the old hoodie) overcoat! Now she is the most stylish pooch on the trails, not to mention the cutest!